Flights are not cheap, that’s a fact. And airfare fluctuations are almost mystery to most of us. With flight fares changing day by day, and even hour by hour, who knows how much a flight should really cost? As consumers, all we want is to pay the least amount possible for a fuss-free flight that will get us to our destination so we can start our vacation. 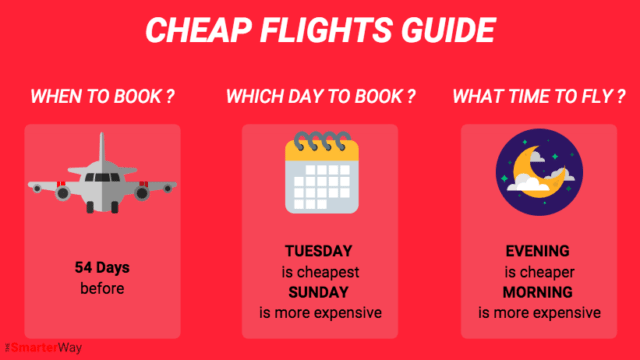 Therefore, we went on a mission to decode how flight prices are set, how we can get a spot cheap flight and how far in advance we should book our trip to save good money. Because cheap tickets are life! Although flying has become increasingly accessible in the last decade, plane tickets are still a considerable expense. Flight fares change so often that finding the best possible price can become a full-time job. Spotting the cheapest ticket is either a matter of sheer luck or a full-time and excruciating, time-consuming task. Who has the time to spend hours exploring the web and comparing every single airline and website for a flight? If you are not a millionaire that can book business without looking at the price and you don’t have much time to spend on research, you need the info that will take you to the good cheap flight that you deserve. Don’t settle for less. By the end of this article, you will know what to do to find and book the best flights available out there. Let’s start by understanding how things work with airlines. Why do flight prices fluctuate so much? Have you always wondered how airlines set their prices? Airfares are like a stock, they are determined mainly by supply and demand. The expected passenger traffic for a specific time and route plays a massive part in how expensive a flight can get. That is why you pay more during peak seasons and for more popular destinations. The other factors that contribute to how much you are going to pay for a ticket are: the type of aircraft and its facilities, the time of travel, the price competitors are charging, the route and the type of seat you are getting. This “mixed salad” of factors can get even more complex as we take into consideration taxes, fuel costs and other fees that add to our final prices. But let’s look at the most critical factors. Airlines make money by defining how much profit they want to have per flight. This is a set sum. Then, the seats in the aircraft are divided per fare codes and cabin seat options: you will have cheaper economy seats, premium economy, business class, first class, etc. This means that in economy, you will have cheaper fare codes and more expensive fare codes and, technically, the sooner you book your ticket, the better chance you have to get an affordable seat. But this is not all. Airlines strive to maximise their profits, and they use complex yield management systems to adjust their pricing based on consumer behaviour. For example, airlines know that if you are a leisure traveller, you tend to book your tickets in advance and prefer to buy them during sales periods or at a discounted rate. Business travellers usually book their trips last minute and are willing to pay full ticket fare or even get a more expensive ticket in exchange for a more comfortable seat. These systems also allow companies to predict and control the availability of seats. This means that airlines can reserve a certain number of seats for regular travellers flying for leisure and others for business fliers. The number of seats available will affect the price we get when you are booking it. Airline websites can also record information about our visit and searches via cookies which can limit the variations in fares we are offered. Air ticket prices do tend to spike: you can find hikes and super low prices in a relatively short period of time. The “incredibly cheap and too good to be true” tickets are usually mistakes from airlines, and they only last a pair of hours until the airline corrects the erroneous price drop. The only way to catch these is for a person to monitor each airline individually and hope to find these accidental price drops. Websites like Scott’s Cheap Flights claim to help you get these hidden rare gems. Cheap tickets aren’t mythological creatures. They exist! Still, cheap tickets exist. In the last year, we see that airlines have been offering reasonably cheap fares for different destinations as demand for them increases, such as India with several secondary cities to discover, the Baltic and Scandinavian countries. This trend indicates that flight prices should not increase much over time because of competition between airlines. More and more airlines are now offering stripped-down fares to be able to compete with their low-cost companions. Nowadays, we get the cheapest flight fares mostly from low-cost airlines. It turns out that those prices can come with a leaner service when compared with traditional airlines, additional fees or have date restrictions (for example, promotions that are only valid for weekdays’ flights). The thing with low-cost airlines is that if you are paying $88 ticket, know what to expect and prep for it. Bring some snacks and fill up your water bottle before boarding. Don’t forget a neck pillow and socks to feel more relaxed and comfortable in your narrow seat. Bring some soundproof headphones and download your fav Netflix shows. We are not implying that cheap always mean low quality, but if you are paying a meagre fare, you can’t expect the comforts and legroom of Emirates first class. How can low-cost carriers offer much lower prices? Low-cost carriers can offer competitive prices because they cut down on services and infrastructure that are not essential. Without compromising safety and quality of the flight, these airlines streamline the way they work by using aircrafts that are more fuel efficient, by adding more seats in the aircraft (sacrificing our much-needed legroom), or by cutting down on offers such as free blankets and drinks. For budget-conscious travellers and for shorter trips, this is ideal. We get to pay less for a ticket on a low-cost carrier and can use that budget to spend in destination instead. Low-cost, long-haul flights are becoming more common as well. Let’s take Scoot’s Singapore to Athens route, for example. A low-cost 11h direct flight to Europe: is this a tougher sell to the consumer? Not at all. The prices are attractive, so if budget is our primary concern, these offers serve a useful purpose. Competition comes into play as airlines watch their competitors very closely. The low-cost model has become popular and forced the big old airlines to rethink their service and price to continue to be competitive. The implications of this are long and complex so we will leave that discussion for a future time. Let’s get back to the point: cheap flights! When should we book our flight to get the best ticket deals? A few reports indicate that airfares have a somewhat weekly cycle that we can use to find the best possible pricing for our next trip. According to that info, Mondays and Tuesdays offer a better chance of getting cheaper rates, while pricing tends to go upward as the week progresses. The recommendation is then to make our booking on a Tuesday to Thursday. It is also reported that the best time for booking a flight is 2 am to 6 am. Will we be burning the midnight oil searching and booking flights? The reason behind this is the time airlines release their inventory and sales. Airlines tend to release their available tickets and flash sales around Monday later in the day. So, when these tickets are issued, the other airlines will quickly try to match these prices on the early hours of Tuesday. If we want to take advantage of a drop that occurs on Monday night, the best time to check fare prices is Tuesday morning. The sales usually last until Thursdays. Weekends are very volatile regarding airfares. Sundaysare said to be the worst day of the week to purchased flights. Some airlines offer seasonal sales which means that prices drop across their routes if you book for flights in a particular time frame. These sales are often limited to a set number of seats. Part of the work of finding a more affordable ticket is tracking and comparison. It is most likely that we’ll find the best price between 1 and four months before the flight. And it is worth to buy flights in advance (6 months to a year) if we see a good promo or an upsized cashback campaign. Some reports claim that 54 days on average before takeoff is when the tickets will be at their lowest, and 112 to 21 days is our prime booking window. There is also potential to save some extra bucks if we book your flight closer to your travel date, let’s say, one week in advance, given that you are not travelling on a peak period (a public holiday or long weekend). You can also reduce the price by combining two one-way tickets instead of buying a round-trip fare. Some claim these trends above are not valid in all cases or it only gives us a minimal discount because these sales are no longer done manually but automatically adjusted. In any case, it doesn’t hurt to check the prices and compare. Once we find the patterns and are flexible with flying dates, we will get the cheap rates. Use the info above to make an informed decision. Apart from the disparity of opinions, the trends still ring true for some airlines, so it is worth to monitor and compare flight prices to get a sense of how the costs for a particular destination fluctuate. Fast fingers – when you do find a deal, act fast! Don’t wait too long to book or you might miss the flight fare you want. Do yourself a favour and subscribe to Scott’s Cheap Flights list. Research is vital, and the info on this newsletter is gold. Even if you are not looking into travelling soon, keeping an eye on the flight prices for your preferred destinations will give you a clear sense of how much the prices change. Sign up for email alerts and follow the social media accounts from your favourite airlines, so you are the first to know about their flash sales. The key to getting a cheap flight is really about flexibility. That means for both travel dates and departing/arriving airports. In specific regions such as Europe, some cities are much less expensive to fly into than others, and the main cities might have multiple airports. If you can be flexible with your destination, you can monitor the prices and choose a cheaper destination. Consider flying to alternative airports to maximise your search and savings. Be open to choose a different airport and get creative when choosing a departure and arrival city. We only have Changi airport to depart from (and a great option it is!) but, for a long-haul flight, consider the possibility of departing from KLIA, for example. For some airlines, savings can go up to $200+ per ticket when flying from Malaysia to Europe, for example. If you have the time to depart from Kuala Lumpur instead, you can save some good money. If you can avoid flying on the busiest, most popular timings for a destination, you will get a cheaper fare. Be open to search for odd hours and mid-week departures. Look at layovers as an extra travel experience, not as a loss of time – tickets with longer layovers are usually cheaper, and it might give you the opportunity to get to know a new city. Be creative and consider purchasing two one-way fares instead of a round-trip fare. They are sometimes cheaper than a return flight. Flight aggregators (Google Flights, Momondo, Skyscanner, etc.) have the chance of adjusting the flight fare slightly, and that can give you a small discount. Use it to your advantage. Seek deals with smaller airlines – but watch out for extra fees and read reviews about their service. Skytrax is an excellent place to read reviews. Incognito mode – Delete your browser’s cookies to stop booking sites from tracking you and prevent them from reviewing your most recent prices. Avoid fully refundable tickets – these tend to be super pricey. Opt for non-refundable and travel insurance to cover possible cancellations instead as this turns to be cheaper. Know your rights – check the TnC’s of your booking. Cancelled flights and reschedules can happen to anyone so know your rights. In case you need to claim compensation for a cancelled flight, use AirHelp. You can use tools like Google Flights to compare legroom, carry-on restrictions and amenities in different flights. If prices among airlines are the same for your destination, this tool will help you choose the most comfortable one. Save time on researching flights and use a price prediction app – Hopper predicts the future of airfare. Watch your next trip in the app and get a notification as soon as the price drops to its lowest point. Never miss a deal! We can save up 10 to 15 per cent per ticket by following the app’s advice.